Sydney is surrounded by properties on steep sites, which can cause problems with access. A common scenario is having an external staircase that weaves down to the ground floor level that accommodates the living areas. We look at two projects that have addressed this in a unique manner. 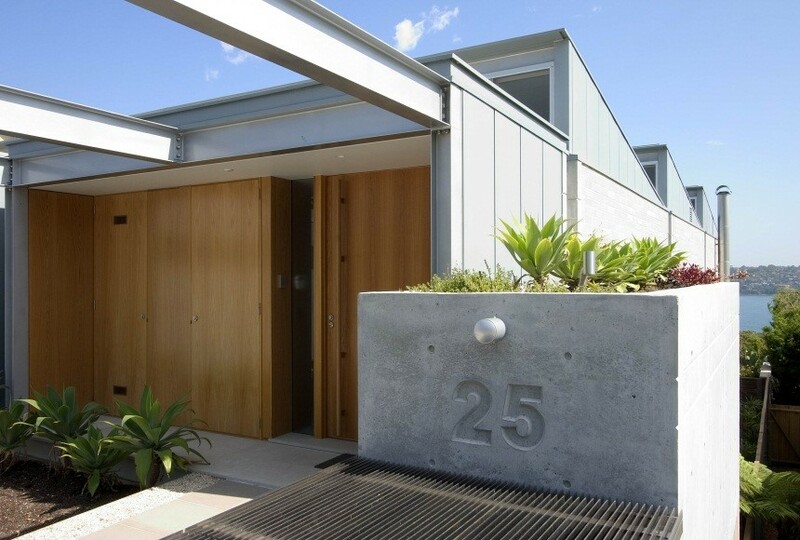 These projects are our Vaucluse House and Mosman House, both situated in Sydney. Our Vaucluse House, completed in 1999, was the first of our houses to explore the use of an internal grand staircase to be used as an entry point to a property. The project is a large harbourside residence located in Coolong Rd, and we had the option of creating an entrance at the ground floor level – 3.5m below the street. Instead, we brought the entrance to the street. An entry pavilion structure was designed at street level, set back from the street by the required 6m setback. From here you enter the gallery space which houses a 3m wide staircase, which would allow for two people to easily walk up or down, and would suit any gathering that takes place. 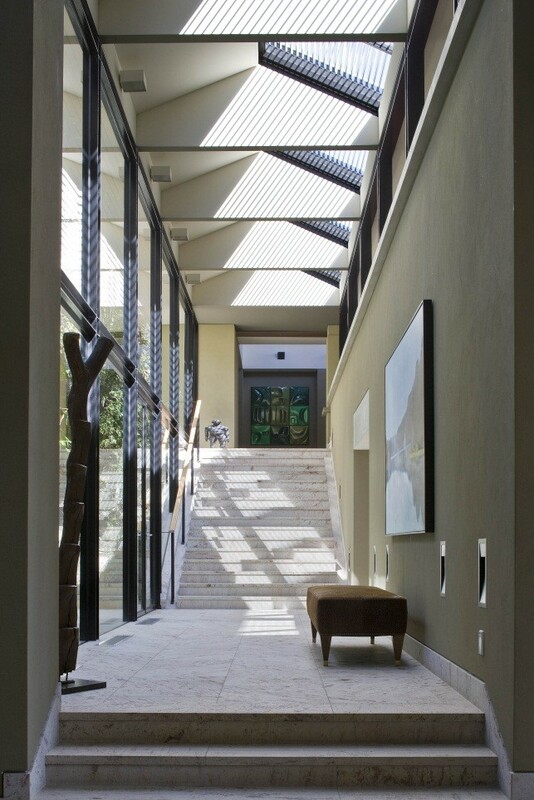 In order to make this entry work, the gallery needed to be a spectacular space. Skylights were added and the walls utilised for displaying art. The gallery was treated as a ‘veranda’ with the external render walls moving into this space. On the other side are glazed walls that allow you glimpses of the harbour. Descending the staircase, the house opens up and you arrived in a two-storey entry foyer that leads you to the formal or informal areas of the house, as well as the harbour rooms. The staircase also acts as the roof to the driveway for the underground parking. Another house that was positioned on a steep slope with the entry on the first floor level is the Mosman House. By utilising the site fully, there was very little room available to have an external staircase leading to the living areas a storey below. 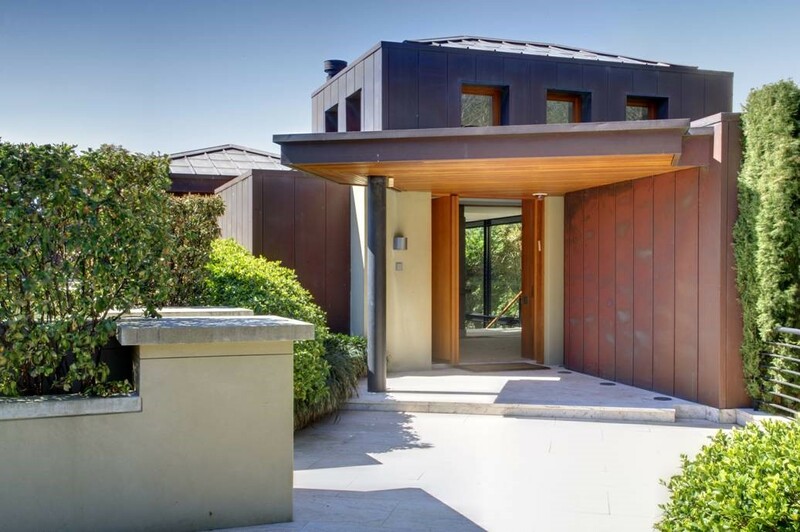 Instead, the entry for the house is located at street level, and accessed through an entry portico that leads into the entry foyer through a large timber door. On entering the house, the saw tooth roof structure is exposed and the volume inside the house is instantly felt. The staircase is wide at the top and tapers down to create a larger space at the bottom of the staircase. Again, a double height volume is created. At the bottom of the stairs the house flows to the main living areas, the view side and to the media room at the rear. Both areas have access to the central courtyard that makes a dramatic statement. 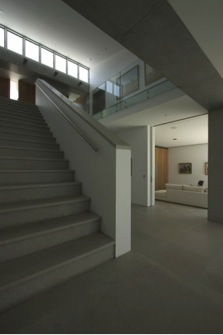 In both houses the stairs become a focal point and allow for a grand entrance.